Damn. I can feel my restraint slipping away. Aaaand I failed. Ordered the most expensive version. I feel guity now. And those 5-7 days can't go fast enough. Only a dual core though. Didn't know they even still made those. Still should be the business for design. Is it an ultra low voltage chip? Those are normally dual core. Maybe to save on TPD because it's a mobile device ? Wacom got a lot of flak with the last iteration of their tablet PC because of fan noise and heat. Pen function is the best i've ever tried on a digitiser and i can now run my applications anywhere i go. Dunno if its worth 3200 euro though. Anyway never spending that much on one again. Wacoms monopoly is showing signs of finally breaking. We are going to have better options in their segment in a few years time. Pillars of Eternity for many weeks. Please note that Nvidia 1050 Ti is faster then this Nvidia 1050. That said there is not so much difference maybe 5-10 frames faster depending on the game. Now I do understand that game even if Nvidia 1050 Ti 4GB DDR5 is slightly faster then Nvidia 1050 2GB DDR5 that Max settings FULL HD does not give good framerate. Propably some adjusted settings example High settings and it is not a FPS so I don't think 60+ constant frames is so important. I doubt I will buy F1 2015 even if I would run that at max settings FULL HD. However you never know if the price is like 5-10 euro+shipping then I might. I bought Battlefield 3 for 8 euro+ shipping costs. Edited by Terminator, 08 June 2017 - 09:35 AM. What's so hot right now? I'd suspect that right now is a poor time to be buying unless you have to. The Zen based AMD mobile chips ought to be out later this year, and they should have an even better power/ value balance than desktop Ryzen has. Coffeelake on the Intel side should be out soon (next month, supposedly) as well. Personally I'd look at buying a new battery if I could find one for a non extortionate amount. It's almost always the battery failing to charge rather than the laptop's fault. Thanks for that, I'll see about waiting it out. The replacement battery is only going to run me about 100 bucks but in my mind I'm just thinking that could be 100 bucks towards something new. It wasn't a pricey laptop in the first place which is why I'm hesitant to spend much on it now a few years later. could you link the laptop model/battery replacement you're looking at? battery replacements, even OEM ones, are usually never nearly that expensive. I've replaced many laptop batteries over the years for laptops that people said were "broken" and I think the most expensive I've ever ran is like $30. Edited by Bartimaeus, 14 September 2017 - 06:43 PM. I bought my last laptop in 2009. After 8 years it couldn't charge more than 20-30% and it would run out in like 10-15 minutes. I looked up what a new battery would cost. 1500 SEK (~188 USD). Sure, it's cheaper than an entirely new laptop, but.. who the hell would spend that much on an 8 year old computer? I bought a new laptop for 800 USD instead. It's the silver one to the right. 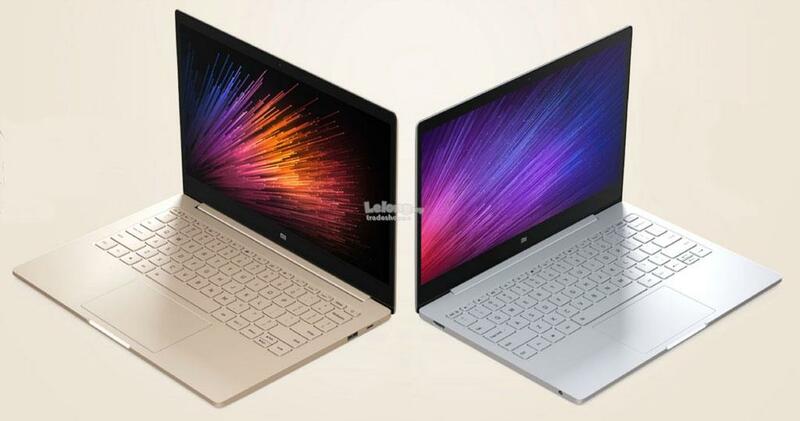 It weighs 1 kg, has around 11-12 hours of battery time, 12.5 inch 1080p IPS screen, full metal body, Core i5-7Y54, 8 GB 1866MHz RAM, 256 GB Samsung SSD, quick charger (30-40 minutes for 50% charge) and AKG speakers (surprisingly good for such a small device). It's perfect for my needs (bedroom/travel laptop for surfing and watching the occasional movie). It's called the Xiaomi Air 12. Only disadvantage so far was the Win 10 Home version in Chinese. I bought a cheap Win 10 Pro license, got the drivers from Xiaomi's forums and did a complete reinstall. Worked perfectly. So my laptop may finally be done for good. A wire from a dewdrop Christmas light somehow got into the small space between the charger and the wall and made contact with the prongs. The charger is definitely fried but I'm not sure how well the laptop made it out of the whole ordeal since it doesn't hold a charge. If it's the Ryzen 1700/ RX580 one be aware that its battery life is poor since they're using desktop rather than laptop chips, though that also makes it one of the better desktop replacement models.